I'm totally blocked right now and can't think of any subject to paint that excites me. 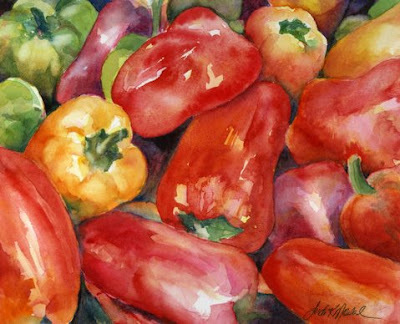 So, trying to "get my groove back," I did a small fast watercolor of these peppers from a photo on Wet Canvas. (I would love to be able to attribute the photographer, but can't find it again!) IT is an exciting photograph, and is also a good way to practice reds, which I find to be VERY difficult. The reds/pinks I have on my standard palette are Rose Madder Genuine, Alizarin Crimson Perm, Cadmium Red, Winsor Red, and Opera (just one pepper got a light wash of that.) Of course I mixed in some yellows in spots, and think that dulled the reds more than I would have liked. I'd be interested in knowing what other people think the "perfect red" palette is. This test was on Diahn's blog tonight, and of course, I HAD to take it. I guess birds of a feather DO stick together... weird, huh? 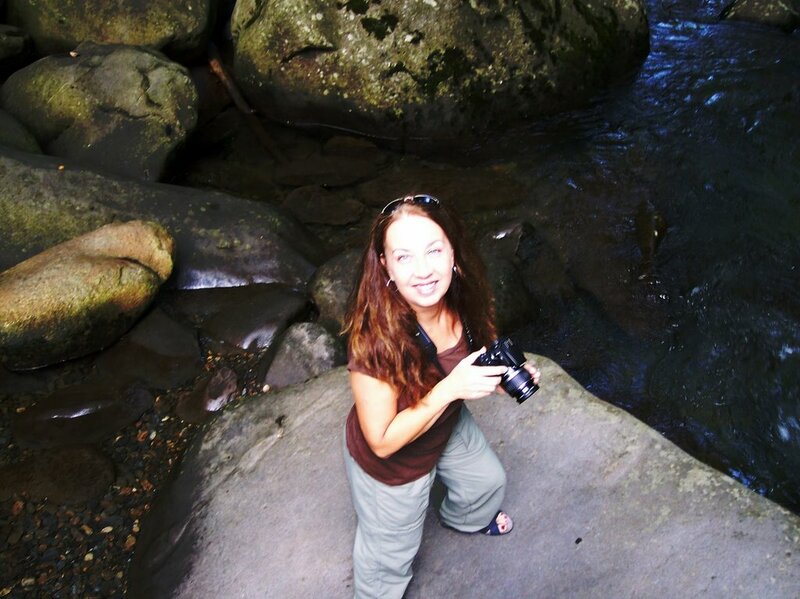 (2) Teri of Teri's Painted Daisies -- like Lin, she blogs DAILY, draws and paints faithfully, and has a huge heart. I don't know how either of them do it! I also don't know if the two of them have ever met in person, but if THEY were neighbors they would be the best of buddies -- of that I'm sure. (3) Debby at Drawing the Motmot -- wow -- her bird drawings are jaw droppingly good and she just recently happily gave pointers on just how to sneak up on a bird. Oh yes -- I'll be trying it, too! Her art is something to aspire to. (5) and while I'm sure somebody has already sent her an e-mail with the same award, I can't leave out Laura of Laurelines who inspires people worldwide with her art, her vision, her dedication, and her darned enviable traveling itinerary. This is just the tip of the iceberg, as they say. Thanks to all of you who post your work and comment and are part of this great creative community! On the first Friday of every month a group of downtown Knoxville galleries and merchants participate in "First Friday", with new shows opening up at the galleries, free food (of sorts), and usually some free out-door entertainment. You would have thought that Diahn and I were prisoners on parole when we figured out that we were going to get to leave family obligations behind for a few hours and go to First Friday together last night. Really, it was kind of sad. Two grown women getting all excited about a few hours out in the heat. Pitiful, actually. When we decided to REALLY eat (not just M&M's and squishy squares of cantaloupe) we settled on Trio Cafe because (1) they had available outdoor seating, (2) they weren't Thai -and-something else fusion food, (3) neither of us had ever eaten there before, and (4) they had salad, which we could draw for this week's EDM challenge. 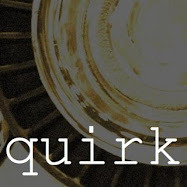 I have to point out that the salad bowls really were oddly shaped -- round with a slanted rim (kind of like these, only smaller, white plastic, and with much more slant) so that if you turned your bowl JUST SO ... with the high side in the back ... only you could see your salad. You could hide behind the high rim if you wanted, so nobody could see if you dripped salad dressing down your chin or if a long piece of frisee didn't quite make it into your mouth in the one bite you thought you could pull off. (Well, nobody except the well dressed business man sitting at the table BESIDE you, looking on in horrified disgust. Oh well.) 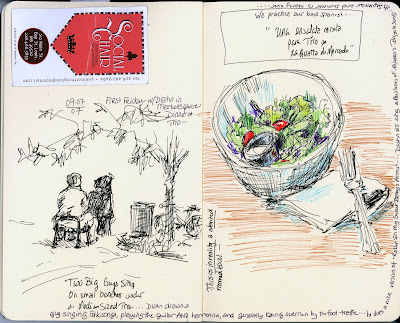 At any rate, the salads looked deliciously cool and refreshing in all that heat, so I sketched as fast as I could, and then tucked in before the whole thing wilted. Afterwards we wandered out into the square to philosophize and listen to a little music from a street musician and draw a few people until it finally (all too quickly!) got too dark to see the details. It was a good night. A very good night, indeed. Finally -- tonight some time to work on painting and sketching! It's so frustrating now to try and re-create the sense of our trip to Canada. After some stalling and hemming and humming and self-distracting and working on other "non-Canada" art, I finally did this quick color study with pastel pencils* -- smeared them around with some water -- then added more pastel and fixative -- then some white acrylic -- and am beginning to get the feeling back! Up north in these woods is one place where the shadows really and truly are BLACK -- once I remembered that I felt more on a roll. And that amazing little streak of turquoise peeking through the clouds on the right? It's true. Yep, the sky there is truly turquoise along the horizon. Even my very literal and non-poetic hubby said, "it feels like you're on top of the world or something..."